« Movie Night "Particle Fever"
We kindly ask all participants and speakers to fill in the online application form before 22 November. All participants applying afterwards are asked to do so at the registration. These persons will, however, not be included in the list of participants, which will be distributed at the meeting. The seminar series “Vienna Central European Seminar on Particle Physics and Quantum Field Theory” was created 2004 (see previous seminars) and is intended to provide stimulating interactions between leading researchers and promising junior physicists. A considerable number of junior scientists participate in these meetings, and we receive special grants for them covering the hotel and part of the local expenses. Our financial resources make it necessary to limit the number of supported participants who will be selected among the applicants. Applications for fellowships should be submitted before September 30, please arrange also for one letter of recommendation to arrive by email vces@dkpi.at before September 30. Information about the acceptance of scholarships will be given by the beginning of October. We invite applications for a limited number of talks from researchers working in areas related to the focus of the seminar. Junior participants, including advanced graduate students, post-doctoral fellows, and junior faculty, will be given priority. Please apply before 30 September. Attention: Extension of deadline to October 31! There are still some free time slots in the schedule of the seminar. Therefore, we extend the deadline and encourage in particular Junior Scientists to apply. Moreover, we also extend the deadline for scholarship applications to October 31. 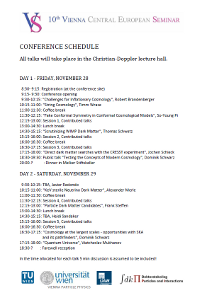 In addition to the talks there will be a poster session on Saturday afternoon and a Conference Reception on Saturday evening. At registration you will be asked to pay the registration fee of € 50. Payment must be by cash; we cannot accept credit cards. There will be no registration fee for students, nor for members of the supporting institutions. 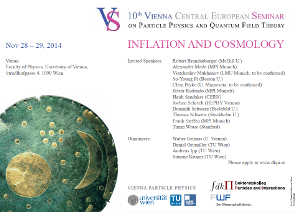 The “Vienna Central European Seminar on Particle Physics and Quantum Field Theory” serves as a forum for coordinating conferences, schools and graduate courses in the Central European region. Please see the webpage http://cepgc.phy.hr/ for information on the “Central European Joint Program of Doctoral Studies in Theoretical Physics”. Nine Central European universities and institutions have joined in a collaboration to strengthen and develop their Ph.D. programmes.